This kitchen display from an EXPO DESIGN CENTER showroom illustrates how YesterTec unfitted Workstations can be instrumental when creating beautiful, open-plan kitchens that need to blend with other rooms. Great for urban lofts, great rooms or family rooms, these work stations define a new type of ‘Home Place’ by enabling design and decorating themes to fill the voids that are created between each piece of furniture. 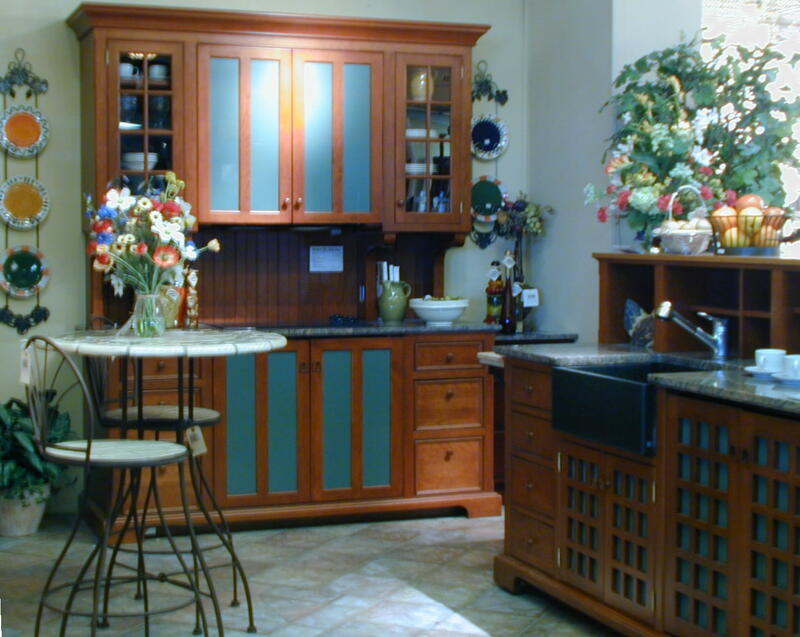 This allows other rooms to blend seamlessly into the kitchen. 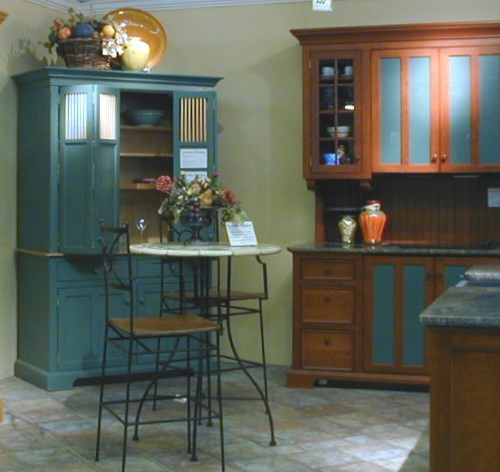 This complete showroom kitchen features (above) an Old English Pine food storage Armoire containing a full height Subzero 700 refrigerator/freezer, a full height pantry with many pull-out shelves. The paneling on each side of this piece is actually a pair of bi-fold doors that open to reveal one-can-deep shelving. The arched area above the refrigerator is a cavernous storage area as well. The painted (Deep Ocean Green) Working Pantry Unit is one of our most popular workstations as it can find use in many areas of the home, hotel room and office. For the showroom it is outfitted with a sink, wine racks and stemware holders above its concealed countertop food preparation area. These can also be fitted with concealed undercounter refrigerators, which convert them into wonderful Hospitality Centers. The Hampton’s Cherry island Sink Unit with a Storage Unit above conceals a standard dishwasher behind its grid style (inspired by nautical hatch covers) doors and features a soapstone apron front sink. The storage unit hides the messy countertop from view from the adjacent living area and also adds a lot of very useful food prep countertop. A 30-inch electric oven and an over-the-range microwave oven are safely concealed in the Hampton’s Cherry range that utilizes our U.L. Listed technology that allows the ‘hot’ appliances to be concealed. 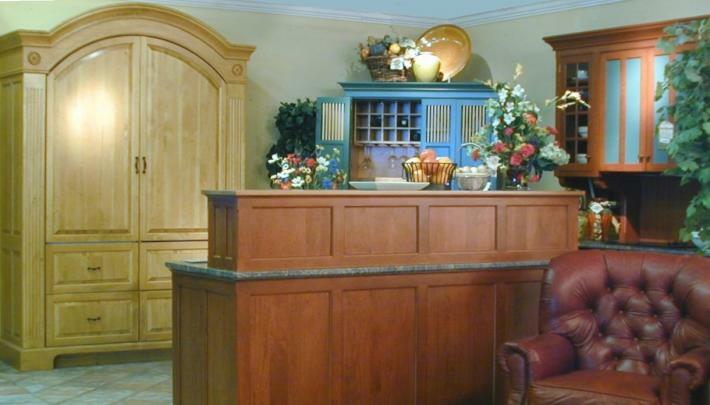 Counter tops in the various workstations are granite, natural cherry and butcher block which illustrates how separate pieces can optimize the use of different materials for various uses.